World Photography day is celebrated on August 19th every year to celebrate the passion of the photographers around the world. It was aimed to inspire photographers across the world to share a single photo with the world, with a plaintive purpose:' It's to share with the world, their world as how they see it'. Frenchmen Louis Daguerre and Joseph Nicephore Niepce invented the first Daguerreotype photography process in 1837. On August 19th, 1839 the French government purchased the patent for the Daguerreotype process from the French Academy of Sciences and termed the invention as a gift "Free to the World". Did you also know that the Daguerreotype wasn't the first photographic picture. Joseph Nicephore Niepce captured the first photo in 1826 using Heliography and the picture was known as "View from the Window at Le Gras". World Photo day was started as a project on August 19th, 2010 by it's founder Korske Ara. The first online online gallery received a warm welcome with atleast 270 photographers sharing their pictures with the world and people from more than 100 countries visited the site. 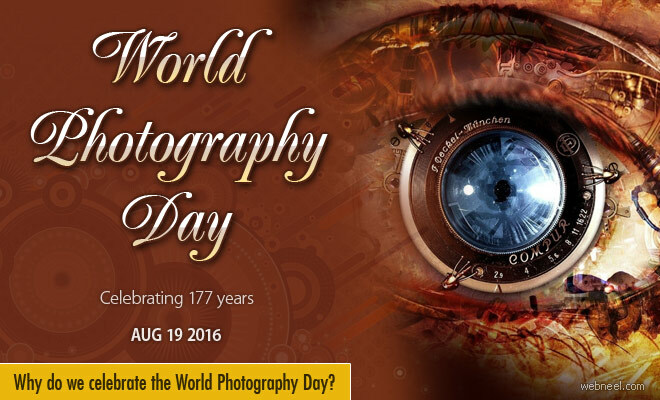 From then on, the numbers have been growing steadily and also making the 'World Photography Day' an instant success. According to the World Photo day founder, Korske Ara, "Millions of people around the world are reached by our efforts to celebrate photography and thousands of photographers are getting involved through independent community events, competitions and promotions".